Since its establishment in 2008, CTTS Holidays has been providing great services within the tourism industry. Today, they have grown to be a reputable bus operator, partnering with numerous travel agents across the globe. In Malaysia, CTTS Holidays operates by the coastal lines at numerous jetties including Jetty Kuala Besut, Jetty Merang and Jetty Shahbandar, all serving as gateways to the beautiful Perhentian Island. Aside from the mentioned jetties, CTTS Holidays also provide trips to many tourist attractions located within the inland of Peninsular Malaysia. Among them include Kuala Lumpur, Penang, Johor and more. 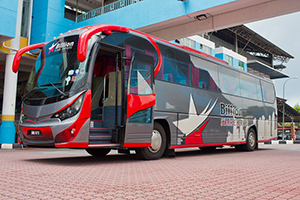 Their fleets are fully air-conditioned with fabric cushion seats and 27 seats. These seats are able to recline and have ample of legroom between them, offering passengers a comfortable ride heading towards their destinations. CatchThatBus offers online bus tickets to many routes covered by CTTS Holidays as well as seat availability features. You can book your bus ticket online from our website or via mobile app which can be downloaded for free on Google Play or App Store.